After the great success of the community partnership forged between Zitko Consulting and The Sports Academy (@ Hunts County SC, Hemingford Grey, Cambridgeshire) in 2015, we are delighted to confirm that the joint venture has been extended into the new season. We are so proud that the junior squash club can continue to operate at the highest standard thanks to our 2016-17 season support. Supporting local projects has always been of real importance to us at Zitko and with Managing Director George Zitko’s love of racket sports and belief in what sport gives to young people, this partnership works brilliantly to support the objectives of both parties. The Sports Academy & Hunts County Squash Club focuses on junior development both on and off court. 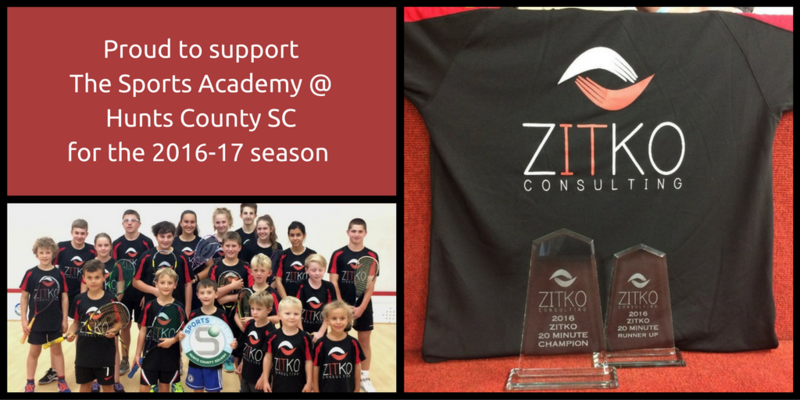 The generous support from Zitko Consulting provides a clear identity for the junior community at the club; with Zitko branded team shirts issued to every youngster – from the four year old ‘mini-squashers’, to players in the Elite Squad with Under 19 top 10 national rankings. 7 out of 11 titles at the 2016 Cambridgeshire Junior County Championships were won by Zitko Consulting sponsored players – a great benchmark for their aspirations together at the start of this new sponsorship cycle. The partnership also includes sponsorship of an all-inclusive competition for all players in the club – with the annual “Zitko 20-minute Handicap Championships”. Aiming to give every entrant the same chance of winning, the 20 minute non-stop format is not only massively demanding but wonderfully entertaining, creating an atmosphere at the club during the three week event which is one of the highlights of the season. Beautiful branded trophies and sponsored shirts for every entrant add real quality to the already massively popular event.